Flavor Text: Leading from the rear has it’s advantages. Danigral - 5 out of 5. If Attaché is the muscle of a Government deck, Lt. Stewart is the skeleton. Sure, he is an expensive glorified support character, but he can go to stories if necessary. His flavor is spot on, as I can see a General issuing orders to his minions from HQ. He just makes everything more efficient, especially if HQ is San Marco Basilica. A couple pumps and you can put out 4-/6-cost characters out for free. Do you remember that other loyal character that reduced Government characters by 1? Yeah, he’s a candle to Stewart’s sun. mnBroncos - 5 out of 5. 3 cost for 3 icons, 4 skill, and toughness. Sure has loyal but the deck you’re probably putting this guy in will benefit from that. As far as I can tell this is the only resource acceleration in agency and it can be a very strong one at that. On turn 2 you could possibly reduce by 2. 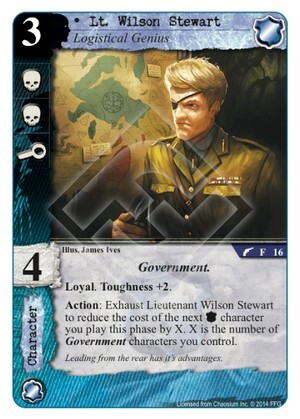 If that gets another Government character in play on turn 3 you can probably play a 7 cost (four domain plus 3 Government characters). Very strong build around card. Obtuse - 5 out of 5. This is the guy that brings it all together for mono Agency decks. No minimum! Combine him with San Marco Basilica and go nuts. All those big Agency bodies that were tough to play before? How would you like to play them for free or close to free? With a skill of 4 and Toughness +2 he gets around some of the removal cards out there. A character you don’t want to see across from you if you don’t have an answer for him. Kamacausey - 5 out of 5. What's not to love about this guy?!? He's reasonably costed with 3 icons and resilient with his toughness+2. He will be the centerpiece in government decks forever more. livingend - 5 out of 5. Every card I rated 5 out of 5 so far is an insult to this guy. When a card defines its own deck archetype, turns mediocre cards like Officer Gibson and Military Attaché into staples and gives us a reason to abandon every other faction just to play with it, then you know there’s some powerful **** going on. And since the most important bits have already been covered by the previous reviews, I’m just gonna leave it at that. Verdict: Wilson is love, Wilson is life. WWDrakey & Ire - 5 out of 5. Could never be anything else. Special Agent Clarkston no longer feels like the sole support pillar of the Government. Correct, as per the FAQ. If a players uses a combination of effects to reduce the cost of a card where one of the effects has the “minimum of 1” stipulation, and the other reducing effect does not, the “minimum of 1” takes precedence.